The process of accession negotiations with the European Union is a de facto suspension of sovereignty for the candidate country through legislative will. Bulgaria and many other countries that have already joined the EU or are in the process of accession, do not consider the process like this, but in the case of Turkey this suspension of equality cannot be controlled for a very long time. 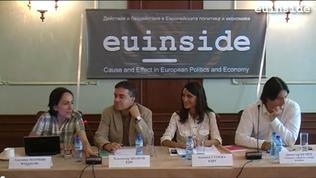 This was one of the main and very interesting theses of Vladimir Shopov, a political scientist, expressed during the discussion Turkey And The European Union: Formulas For Common Future, organised in Sofia by euinside, the European Strategies and Policies Institute|ESPI and StratCom of Plamen Ralchev on July 13. Mr Shopov deliberated on the topic How Do We Think About The Benefits And Challenges Of Turkey's Membership?, by stating that Turkey already had a very complete mindset, economic and external political infrastructure of a regional power than it had 15 or 20 years ago. This is the reason why the country will be less and less inclined to abide. On the other hand, all these factors disparage the role of the negotiations process itself because it is no secret that the decision for Turkey's membership in the EU will be taken outside the accession negotiations process. He outlined the main arguments "for" and "against" Turkey's membership in the EU. One of the main for-arguments is the geopolitical one, according to which Turkey's largeness will play the role of a geostrategic multiplicator that will help Europe become a more convincing global player. A serious against-argument is that Turkey's divergence (in many aspects) will diminish the cohesion in the EU itself and its capacity to speak with a "single voice".